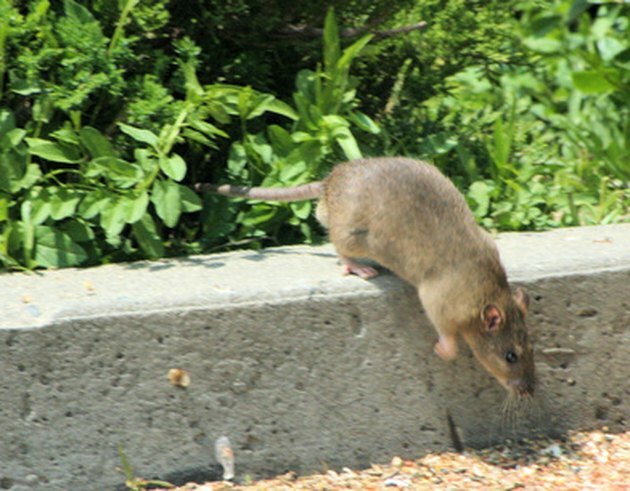 Rats are a common pest outside homes and in gardens. They eat almost any food, including tomato fruit right off the plants. You can recognize the damage from rats by their tracks and droppings around the plants. To eliminate a rat infestation in your tomato garden, set up traps and lay down repellents that will keep the rats away. Remove any other food sources that may be tempting the rats to your tomatoes. This may include dog food bowls or a compost pile nearby. Pour three to five moth balls into a small cloth bag. Drive a stake into the ground next to your tomato plants and tie the bag to the top of the stake by the string closures. Moth balls are a natural rat repellent, but they dissolve in the rain so you will have to replace the balls after each rainfall. Be sure moth ball soaked rainwater cannot drain onto the tomatoes. Purchase fox urine pellets from a local hunting store and spread them on the ground around the tomatoes and around the perimeter of the garden, according to the instructions on the package. Replace the pellets after each heavy rainfall. Set out rat traps throughout the tomato garden and along the edges of the garden. For bait, smear peanut butter on the trigger. Check the traps daily. If a rat does trigger the trap, wear protective gloves and dispose of the body in a trash bag.